To mark the start of Advent and our preparation for welcoming Jesus at Christmas, students on both sites celebrated a very moving liturgy that highlighted to real meaning of the season, namely, welcoming and finding a place for God and our neighbour in our hearts and in our lives. With this in mind, we based our Advent liturgy on the need to welcome the stranger, and so, starting in their form room, the liturgy took our students to various “stations” around the school where they reflected on how we as individuals, and society as a whole, can make room for all those who find themselves marginalised or left out in any way. We prayed in particular for refugees forced to flee the terrors of their homeland, that they will find welcome, friendship and safety in their new communities. The central focus of our liturgy was the Lampedusa Cross. Lampedusa is an island south of Sicily, off which hundreds of refugees had drowned trying to reach safety, and where a local carpenter, Francesco Tuccio, fashioned crosses made from the driftwood of wrecked boats and to offer them to survivors as a small but powerful symbol of hope. CAFOD kindly leant us some of these actual crosses, around which our students offered their own prayers and messages of hope. Back in the form room, the liturgy concluded with our students considering what practical help they could give this Advent to those in need. Each form has been asked to choose from CAFOD's charity gift range and so to raise funds for one of these virtual and ethical presents that can help transform the lives of poor communities and families in developing countries. 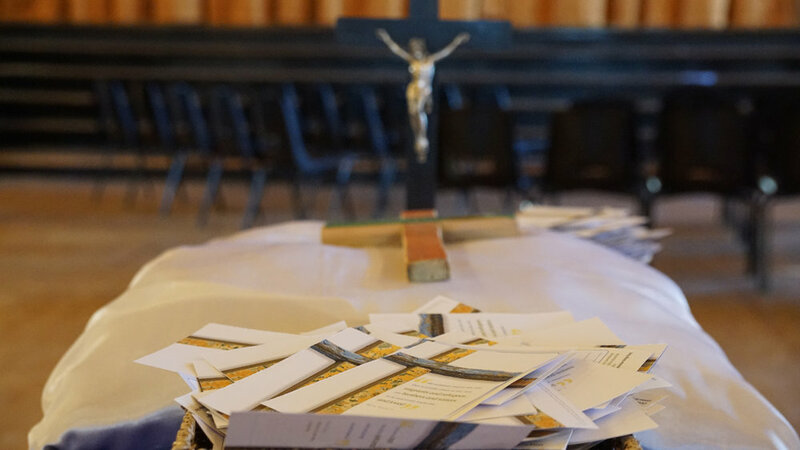 The liturgy gave much food for thought and enabled our students to make a very prayerful start to the season. We wish all those connected with the St Bede’s and St Joseph’s community a prayerful and holy Advent as you prepare to welcome Christ at Christmas in the face of both friend and stranger. “The advent service was very calming and reflective. The service was very different having our own in our form being able to reflect on the true meaning of advent. We then walked to different stations around school, one of the stations was about writing a prayer to the refugees about not losing hope. There was stations in the hall that told us what happened and everyone was really respectful and quiet”.